Fonepad is not the first tablet phone, previously had a lot of manufacturers that offer tablet plus phone, their device on the electronics market known as Phabet. Manufacturers saw the market gap between the 7-inch tablet with a smartphone. Since the 7-inch tablet has a small size, easy to carry more users such as mobile phones. Manufacturers phabet hoping to meet the needs of tablet users as well as mobile phone users. Phabet is a relatively new market segment, manufacturers are faced with a tendency phabet user: Are fairly comfortable using a phone with a larger size than the smartphone that smaller and thinner? Asus Android tablet that already had the market trying to get into this market gap by launching Fonepad. The device was introduced at Mobile World Congress 2013 in Barcelona, 25 February 2013. The plan will be marketed globally in April 2013. Aside from being a tablet, Fonepad has features to support the functions of a mobile phone. The device is equipped with a Micro-SIM card slot which can also be used to connect to the 3G network .. For internal memory provided two options, 8GB or 16GB. If less memory, expandable with microSD up to 32GB. 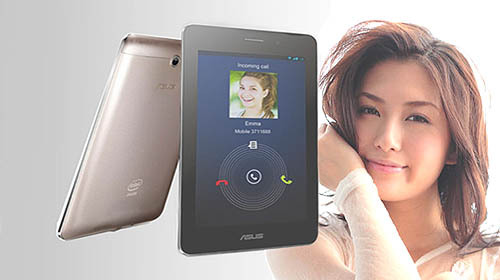 Fonepad Asus is a phone tablet that uses the latest operating system based on Android, which is version 4.1 Jelly Bean. Fonepad uses a capacitive touch screen measuring 7-inch with 1280 x 800 pixels. The screen uses a black frame, while the rear panel is available in gray and gold. To gain access speed of 1.2GHz, the performance Fonepad equipped with Intel Atom Z2420 processor and supported by 1GB of RAM and PowerVR SGX540 graphics processor unit. Fonepad use 4.270mAh capacity battery is claimed to last up to 9 hours of continuous use. Like most cell phones, Fonepad is also equipped rear camera with a 3 megapixel power and a 1.3 megapixel front camera. Fonepad be sold at a price of 249 U.S. dollars, buyers can use two devices at once, tablets and mobile phones.